Biographical Information: Alan was born on 21 December 1922 at 15 Marks Road, Stubbington, Hampshire to parents William and Nellie Cooper. He was the youngest of four children. He had two brothers, Bernard and Norman, plus a sister, Sonja. Alan He attended school at Crofton, Stubbington, Hampshire until he was about 11 years old. Afterwards, he attended The Royal Hospital School, Holbrook from September 1934 to May 1938. Upon completion of school in 1938, Alan followed his father's footsteps and joined the Royal Navy. 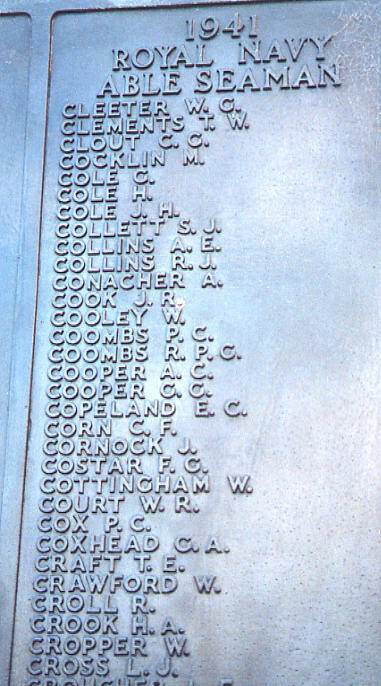 His father, (William Charles Cooper, MX 53563) had served many years in the Navy, to include 6 months aboard H.M.S. Hood (04 Jan - 01 Jun 1939). He would go on to retire as a Chief Ordnance Artificer. Alan's brothers also served in the military. Alan was trained at H.M.S. St Vincent. He ultimately joined the crew of Hood on 01 June 1939 (his father left the ship that same day). He went on serve as a member of one of the 4" gun crews. He is remembered as being good at telling his mother some naughty yarns. He was also reputed to be a practical joker. He was 18 years old at the time of his loss. We have no additional information.